Memoirs & biographies can be hit or miss. Sometimes, another person's life just isn't that interesting. Everybody loves to hear the dirt & get a glimpse behind the scenes with the infamamous, the great, the celebrities. But ordinary people? Why would you want to read that? Jennifer Coburn, despite being an 'ordinary person', has penned a must-read memoir about her travels with her daughter in Europe. Prone to the pessimistic idea that she would die young, Coburn decides to take her daughter on a European adventure so she'll have something to remember her by. Spoiler alert: Jennifer Coburn does NOT die young. She & her daughter travel all over Europe over four trips in eight years In fact, I'm fairly sure she's still alive & well. The story is engaging because she's just like us, making silly tourist mistakes, facing her fears of leaving the hotel room & getting lost. In fact, the book is really funny & I'm enjoying it immensely. If you're looking for a great summer read for yourself or a gift for mom, this is a good bet. It's $10 for Kindle or $13 for paperback on Amazon.ca. Coburn lives in San Diego with her husband, William, and their daughter, Katie. 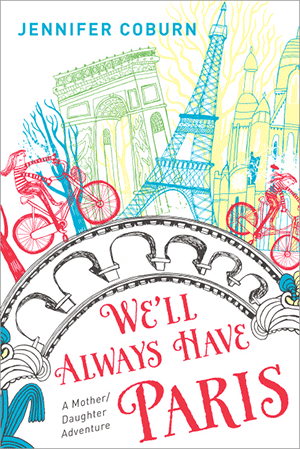 We'll Always Have Paris is her first memoir. For more information about Jennifer & the book, visit her website, www.jennifercoburn.com.